In recent years, comic books adaptations have taken the path of big bank bailouts. Greedy and heartless. Too big to fail. Marvel movies specifically have been driven by ever-increasing set pieces and less character development or dramatic stakes. That’s a major red flag. So while Civil War has a Mumbai level crisis of overpopulation and density going on, the film wisely scales back the grandeur, giving us more heroes while knowing that they don’t necessarily have to be doing more things. For the first time since The Avengers team-up, real interpersonal conflict and dispute is incited. The steady, often electrifying Civil War looks inward more often than outward. After a flashback open that comes full circle in the closing scene – a hallmark of traditionally executed screenwriting – we’re carefully placed back beside the superhero crew one year post their defeat of Ultron and devastating destruction of the fictional country Sokovia. Their tarnished reputation is only further damaged when an attempt by Wanda Maximoff (Elizabeth Olsen) to displace an explosion is sent into a nearby building, killing countless relief aid workers from the imagined African nation Wakanda. As a result, the Secretary of State suggests government oversight, asking The Avengers to sign “The Sokovia Accords.” And that’s where things begin to get interesting. Tony Stark (Robert Downey Jr.) is all in; he created Ultron and feels responsible. On the other hand, Steve Rogers (Chris Evans) trusts his own inner reasoning. What makes the movie so absorbing is its willingness to tackle weighty issues when these vigilante heroes aren’t addressed by their monikers, but rather by their names. That may seem an odd choice to make too. However, it allows the individuals of unmatched power to be relatable on a human level, all before putting them back into the suits and the armor to duke it out over moral correctness. Stark wants to make amends for his past. Rogers wants to amend the wrongs done to his friend Bucky (Sebasatian Stan). The dividing and decisive rift is all a part of the plan by the plotting Zemo (Daniel Brühl). Marvel finally has a complex villain with rightful reason linked to the motives of the protagonists. Zemo, along with Cap and Iron Man, seeks vengeance. The layman has no powers or gimmicks or tricks. He’s clever and determined to rip apart The Avengers, not by his hands, but by enabling their own and creating adversaries out of friends. In my review of 2014’s Winter Soldier – a deflated film that doesn’t come together – I noted how much Marvel needed the Russo brothers to return for a followup. It was clear then and even more so now that the two can direct fluid, ambitious action scenes without neglecting the drama of the story. Civil War is a giant on a slackline; so many characters, styles, narrative dissimilarities. And yet the Russos juggle them effortlessly. When the breakout brawl finally does happen, the scene becomes a cue for the directors to exhibit a graceful sense of action, crisis, and light-hearted humor. With expert sound editing/mixing and a diverse visual palette still existing within the picture at hand, the Russos prove to be formidable filmmakers. We get a long-awaited introduction to the new high school iteration of Spider-Man (Tom Holland), as well as a scene-stealing Black Panther. He’s T’Challa (Chadwick Boseman), heir apparent and protector of Wakanda, and I can’t wait to see more of his story. Say what you will, but of any character here, the Black Panther leaves the biggest impression. The main concern for Marvel going forward isn’t their standalone movies. For the most part, problems occur when they bring out the entire circus into the ring at once. Studio head Kevin Feige seems to think that the spectacle can be tamed by the creative team, and all things considered, Civil War does do that. Regardless, it goes without saying that characters flat-out go missing, or even worse, make cameo appearances without influencing the story’s overall trajectory. A few scenes unfold like a recess game of Red Rover with a new face called upon but unable to break through the grips of Iron Man or Captain America. Downey gives the film’s most emotionally invested performance, whereas Evans is stuck playing an unworldly man acting on specious and dated ideals. Movies this big will always have issues though. So look towards the film’s operatic conclusion for all of the things it does right, echoing the dynamics of Shakespeare’s Macbeth. The Avengers aren’t facing end of the world consequences. Alternatively, they’re facing each other. In this contentious case it comes down to Tony versus Steve and Bucky. 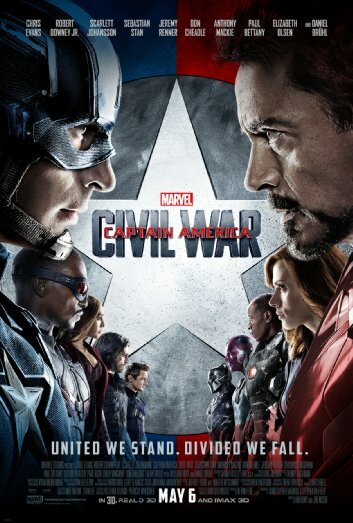 The irreconcilable differences and real world repercussions of Civil War set up an even bigger battle, and here’s to hoping that whatever comes next matches the quality and integrity of this Marvel touchstone.